Before we relocate to Chile, we are taking a week's holiday driving a great big equilateral triangle (For a given definition of triangle, and an even looser definition of equilateral) through Australia's Top End. The morning after our night-time boat-ride, we had been promised a boat ride in the daylight in a place called Nitmiluk. And that's all we knew about that. Having done all of my schooling in other places, my Australian geography is rather spotty, and in all our driving we were busy being stunned by the geography happening outside the windows of the car and we never took the time to do half the reading in the guide-books that we ought to have done. Take a moment and open up Google earth, or Google maps, set it to satellite view, and do a search for Katherine Gorge. Then zoom in until you can see individual tree-dots and white-caps on the water on the Katherine River. I'll even cheat - there's a shortcut on this page: photo number eight. Fissures in the landscape - kilometers long, as if the great red back of Australia had taken a mighty continent-cracking blow and split open along its planes and faces. The cracks snap out at right angles, regular, geometrical and rectangularly precise. The damage is industrial, almost, at a planet-spanning scale - the fissures are kilometers long and a hundred meters deep. Imagine us, with no expectations beyond a ride on a pretty, silty-banked river in the daylight, approaching a bluff - a scrubbly, rubbly eucalyptus-and-mulga infested bluff, and stepping forward to see a wall of burnt red rock fall away from our feet, down and down and almost out of sight, to a strip of limpid blue water. A big water hidden in the desert. In another twin-hulled swamp boat , we motored along the bottoms of those great cracks, through narrow passages between sheer red walls that opened into right-angled pools of electric blue water that turned its face up to an even bluer sky. There was exhilaration, an awareness of unreality like you walk through in dreams, with tall trees turned to matchsticks by the depth of the canyons, and twenty meters of blue water under our keel in passageways so narrow we could almost brush the walls with our fingers, and there was the knowledge of the mad and the miraculous. Nitmiluk was a place of mad, extravagant, spendthrift throwaway abundance, a slash of wild electric life -technicolor manna in the desert. In a dry country of want and hoarding - a bone-deep desiccated hoarding, of air and sand floors as hot as a scalding bath, and dry sun to parch skin from bones, there was this place only one long step away from sight, hidden between the red rock walls. The Jawoyn call it Nitmiluk - Cicada place. The place name was given by Nabilil, an important character of their dreamtime. He was travelling across the landscape and when he came to the gorge he heard the cicada calling "Nit Nit Nit!" And he stopped here for a time. The waters of the Gorge come from Bolung, who lives in the second pool. He is the creator and the destroyer - the water as life, but also the floods and storms of the wet season. Because of his capricious nature, Bolung is approached with caution. There is no fishing in the second pool. There is no drinking in the second pool, and pregnant women and initiates (all people on the cusp of great changes in life) may not swim in the Katherine Gorge in case that their own energies disturb him and make him rise. These little stories are simple, incomplete- Jawoyn kindergarten tales. The Jawoyn, like the other Australian peoples, measure their learning in their own personal knowledge of the world. History lessons and morality tales are bound up in their creation stories, and tied to features of the landscape and the seasons. Babies are taught toddler stories suitable to their own range of understanding - as are white Australians and tourists. As Jawoyn children grow up and move through stages of life and initiation, they graduate to deeper, richer, versions of the early stories, and learn versions of new ones about new places relevant to for their age, their gender, their moiety, and their position within their people. A man I met at Uluru last Easter had been working there for a year as a ranger with the parks service - babying tourists on walking tours around the rock. He told stories like these about Uluru. The Anangu people there reckoned that since he'd been there about a year, he was about equivalent to a toddler taking its first steps through the place, so they gave him kindergarten stories. Being a gringo isn't the same as being an Anangu. Anangu kids will learn more - upgrading, if you like - as they moved through life and passed through initiations. His initiation, if he chose to pursue it, would be one of endurance - staying there long enough to indicate he cared enough to be worth their sharing. Theres' a modern-day significance to Katherine Gorge as well. It's the place where the Jawoyn people won the first successful native title claim in Australia. In 1989. All a white man needed to claim a piece of Australia was a flock of sheep and a gun, and once he had it, the land was his, forever and a day. The whites with the guns wrote about the Aboriginal people hanging around the place when they got there. You could say that there was clearly precedent, in fact: they even wrote down some of the blackfella histories, but that sort of stuff was anecdata. Between the years 1978 and 1989, the Jawoyn people were asked to demonstrate their up close and personal relations, going back 40 000 years, with every bush and boulder and patch of scrub in the place. But they won. Nitmiluk is theirs now. They promptly rented it back to the park service and, and managing it themselves, share the place with us. Nitmiluk has thirteen gorges in total, but we only sailed through five of them. In the wet season, the water runs so high and fast that the boats can't run on it, and in low season, the water drops so low that in the necks of the gorges natural weirs block the river. Three times we had to disembark (or demount, possibly - they were very little boats) and walk across the neck of the gorge to another boat floating on the other side. We went until we couldn't go any further - by boat or on foot, and stood on a high wall of tumbled rock and couldn’t credit that in the wet the water would flood higher than our heads and sail right over the wall with only a few rapids to mark the place. On our way back up the gorge, we went swimming - which was another surprise for us. Back at the opening of the second gorge, on the downstream side of the gorge, where the river trickled down through a natural weir of sandstone and bottomed into a wide, shallow pool, we were told that our excursion was going to stop for a while so that anyone who wanted to swim could go in. And we'd no idea. We wished we'd read the brochure. Our bathers were back in the car at the Visitor's Center. And I had to go in. I absolutely had to - so I pulled off my shorts and went in in my shirt and underpants and it was the very best swim I'd had since we had left PNG nine years ago. A beach is wonderful thing, but fresh water has a glory, and that day, it was like crystal - cold and clear and sharp. I curvetted. And there were no crocodiles within half a kilometer, so I rode the current up and down until we had to come out and go away from that place. There were no salties there, anyway. The whole park was a water paradise - with people in canoes and bright plastic kayaks and picnicking on the rocks and hiking on the cliffs. The parks service clears out the salties at the end of every wet season, and salts the gorges with saltie traps - the bait is weighed with a tripwire that a freshie isn't heavy enough to spring. The rangers check every morning - if the trip wire is sprung, they go crocodile hunting and no-one goes into the water until the saltwater crocodile comes out. Back at the Visitors Center, we went swimming again, and the swim there was less than glorious. At the Visitors Center, downstream of the gorges, the water was thick and green and dark. The same sort of silty water we'd been puttering through last night with all those freshwater crocodiles. And right above the little swimming jetty there was a colony of fruit bats in the trees doing what fruit bats do. No-one wanted to come swimming with me, not even the indefatigable Sandor. I was faintly custard-like myself, I confess. I didn't want to swim alone in the dark water, so I waited for another lady to come padding down to the jetty and went in when she did. We swam with our heads above the water - the stuff was so thick we couldn't see our own limbs below the surface, and floating with yellow pollen besides. We felt pale-fleshed and vulnerable, and we treaded water with our legs tucked up tight against our chests. "It's marvelous!" We screamed, and waved enthusiastically, at Pippa and Thea and Sandor and Mr Tabubil and told them about all of the wonderful water that they were missing. On shore, all were dour, so the two of us struck courageously out across the river toward the canoes pulled up on the other side, but we lost confidence five meters from the bank and we came back. It wasn't that we didn't believe the harmless freshwater crocodile propaganda, exactly. It was just that we weren't confident that they could sense us either in the murk, and didn't want to have to have to test their good behavior in a head-on collision. Sandor dedicated his holiday in the Northern Territory to eating his way through the flora and fauna of the Top End - prawns, crabs, sea-mussels, oysters, crocodiles, emus and buffalo, fried, roasted, par-boiled and served on a stick. He even stooped to ringtail possum kebab. (Roadkill style.) I never saw him defeated, even when faced with that most quintessentially Australian of gastronomic experiences: the BBQ. The Aussie BBQ is not an American BBQ - with its marinades and slow roasts and baked beans and breads - An Aussie BBQ is - well, it's a simple spread. There's your best cut of cheap beef, simple and stringy - the jaw-tearing sinews and tendons not tenderized by marinades or basting - but simply bashed into charcoaled submission over an open flame. Ditto onions - thin and soggy and black. Wonderbread and margarine - or spongy, untoasted hot dog buns, if you're feeling swish. Tomato Sauce (ketchup) and a big bowl of prefabricated Woolworths coleslaw, and if you're feeling really swanky, cubes of Tasty (TM) cheese and chunks of cocktail snags (sausages) for nibblies while the steaks are cooking. This menu has bested many good men and women, but it did not best Sandor. He chomped his way through a rural Australian steak and declared it a wonderful, unmatched cultural experience. And went back for seconds. In all fairness, Sandor had the right of it. That night we were eating our BBQ by torchlight on a sandbank on the shore of the Katherine River, drinking bush tea brewed from the leaves of the trees that brushed our tables, and in the company of five or six score of freshwater crocodiles, one of which had lumbered up onto the sandbank, hoping for a share of cow-meat. A frisson of exotic excitement (and a soupcon of bone-deep ancestral terror) is a seasoning that can't be beat. Gnawing on a steak with the awareness of white teeth and pink gullet next to your ankles is a deeply moving culinary experience. It had been a 300 kilometer drive from Kakadu to Katherine. The road wound up from the floodplains of the National Park and headed into sandstone hills , our van chugging up the lips of escarpments above great red valleys and swinging down the sides of crumpled red gorges. We stopped in Pine Creek for lunch - where men had discovered gold while laying posts for the Overland Telegraph. At the top of the plateau the road flattened out, and we came into Katherine. Katherine is not what one would call a lovely town. It looks as if once it was a thriving community, but now it is, more or less,only the gateway to the famous Katherine Gorges. There doesn't seem to be any industry here except the tourists coming through. We didn't fancy McDonalds, or a BBQ in the backyard of our hotel. Instead, Thea found us a night cruise with crocodiles. A history: In 1879, a Mr Alfred Giles drove twelve thousand sheep and twenty five hundred cattle from Port Agusta at the tip of the Spencer gulf through the driest parts of the continent, all the way up to Katherine. Most of them made it, too. In one great sprint across a dry place - ten days without sleep or water - he lost only 300 sheep. It was a heroic endeavor by any standards of endurance, and it was meant to be the spearhead of a great northern wool industry. Unfortunately, while the sheep, no-one followed him north. The trip was simply too daunting, and in Katherine in the 1880s, there was no reachable market for the wool. Within only 8 years, he had to sell up. He left behind four giant Indian Rain trees - one planted for each of his four children, and Katherine Township. Our river cruise was at the bottom of a gorge on the edge of Alfred Giles' homestead- a dozen passengers in a tinnie. (a tinnie is a small aluminium boat with an outboard motor mounted on the back.) The river was narrow and swift, with dusty, silted banks. The silt marked the high-water line, and in a good season, that line can be very high indeed. In 1998, heavy rains swelled the river so much that in a matter of hours, the entire town of Katherine, way up on the plateau, was under two meters of water. When the waters flood like this, salt water crocodiles are washed down into freshwater territory and cause… incidents. (Two-and-a-half meter saltwater crocodiles cruising the streets of Katherine are certainly what I'd call incidents.) When the waters went down, we were told, Woolworths employees found two of them, making themselves very comfortable in the meat department of the town supermarket. Tonight there were crocodiles every where we looked - freshwater crocodiles. Freshies are smaller, narrower, and more finely built than the saltwater behemoths - and they are, in theory, scared stiff of humans. Interesting fact: Up on the Arhnhem land plateau where humans don't and never did go, the freshwater crocodiles have no fear of people. Up there they will attack and threaten boats and treat a human as lunch. Down here, 40 000 years of hunting have exerted selective pressure on the psychology of the crocodile. The freshies that stayed when they heard a noise and stuck up their head to look around - they got et. By humans or salties, depending who was hungriest. Today's Top End freshies won't go for you unless you step on them, or treat them like Disneyland robots and prod at them, hoping for a photograph. This last bit of information, courtesy of our night river guide, was delivered in a very airy manner, and we gave each other long looks that said that, for choice, one still would not swim in narrow river with a freshwater crocodile hanging out on a branch every meter or two of river-way. Or picnic on a riverbank alone at night. So there. We puttered gently downstream, riding mostly with the current, sporadically fueled on spurts of reptilian adrenalin. Our guide would spot a crocodile, approach the crocodile, and we'd see it skitter. They truly didn't think much of us - one even indulged our terrible tourist appetites with an exhibition of the famous crocodile gallop - standing up on his hind legs and galloping across half a league of sand-flat into the water at 10 miles an hour. As we puttered downstream, it grew dark, and the crocodiles on the banks and branches blurred into the trunks and as the light faded, disappeared altogether. Like Alice's Cheshire Cat with it's smile left till last, the crocodiles were dark smears on a dark night - and two ruby lamps, one in each eye, shining in the dark. We came ashore with torches. Rough tables and chairs were waiting on the sandbank. Our guides lit a campfire and offered us champagne. I stepped in a tin bucket in the dark. Clang! My torch went wide and I landed on one knee. Our guides set a table with bottles of wine - incongruously, a South Australian Chardonnay. From Adelaide, our town. And a crocodile came ashore and waddled right up to us, and he was large. "Who wants what?" Our guide called out. "White or red?" "We really don't have an answer for you right now." Thea clutched the sproglet to her chest. She laughed, nervously. "There's - um - there's a very big crocodile about two feet from my feet. And, um - ?" "Is that so." He said. He picked up the bucket I'd stepped in, and pulled out a steak. "He's been coming here at dinner time for about six years now, I reckon." He said. He hefted the steak in his left hand, and the crocodile unhinged his jaw and exposed about a meter and a half of pink gullet. The guide flipped the steak into the crocodile's mouth. "He's a good boy." He said fondly. Cruising back upstream in the dark, we played at looking for crocodiles, shining our flashlights across the water and watching for eye-shine. Crocodile eyes glow red, like coals, like rubies. They sparkled in the water and on the banks, between tree-roots and under fallen logs. Fish swam in circles in our torch beams and turtles came up to the surface, gulping at our light. Their eyes glittered yellow. We whispered softly, and watched the night. We have had a fun weekend, we have! At 4:30 on Saturday morning, the whole city was woken up by quite a NICE little earthquake - it was only a 5.1, but it was also only 41 km away, and it rang us like a bell. We felt two great bangs, as if our building had been hit with a huge sledgehammer, and a great roar with each one, and much vibration after each - like a struck bell vibrating until it dampens down. I felt the first one in a dream and woke up to the after-shaking, and the second one hit while I was solidly awake and when it stopped Mr Tabubil and I lay still, waiting to see if there would be any more. And it was some time before we went back to sleep. Today we went out to lunch with friends, and everyone was inspired to talk about earthquakes - we heard hair-raising stories about the 8.8 quake in 2010 - which is still big conversation here a year later. My friend Alba and her husband Sebastian live on the 10th floor of their building - they were having a party when it hit. Sebastian told us "There were 50 people in our flat - so imagine 50 people's worth of wine glasses and wine bottles and water glasses and water bottles going smashing to the floor." The quake started small - and then grew, and the power went out, so Alba staggered to the kitchen for candles, and then it grew so big that Sebastian herded everyone into the point of the apartment where three door-frames and two structural walls met, and they sheltered there while the shaking and the roaring grew and picked them up and tossed them and threw them from wall to wall to wall. Drifts of smashed glass were washing across the floor, back and forth, hissing on the tiles, and the earthquake was roaring, and outside, the dark was lit up by red and yellow explosions as power transformers blew up, and right in front of them, while they watched, a wall split open from floor to ceiling. Another couple we know live on the third floor of a very small building and got down and outside during the quake, and afterwards, they climbed back upstairs to change their pajamas for real clothes, and packed backpacks full of water bottles and apples (which is what they had to share) and spent the night hiking across town to see if anyone needed help. All the way through the city they had to step around sheets of smashed glass and fallen lumps of concrete the size of dining tables. It's a damn good thing that that earthquake happened at night. If it had happened during the day when people were out and on the streets - there would have been a terrible terrible mess. At any event, we came home this evening feeling quite happy that the local tectonic plates had had their big stretch-out before we arrived. And then tonight, at about half past seven, I stepped out of the kitchen into the living room where Mr Tabubil, who'd been sorting power cables for his electronic bits and pieces, was sitting upright on the sofa. The ceiling light was starting to swing and the floors were shaking - lowly, the way they often do, for we get many tremors here. They shudder,or they bang, and then they peter out, but this one started to build. I looked out the window and the bamboo blinds on our bedroom balcony were swinging back and forth and then the BALCONY was swinging back and forth and the trees in the street were swaying and blowing and inside I could hear rattling in the kitchen as the plates and glasses danced in the cupboards. The whole solid world was turned to jeopardy - shaking and rattling and jumping; NOTHING was solid or stable or safe and Mr Tabubil looked at me and said "NOW." and picked me up by the shoulders and we danced across the shaking floor and landed in the doorway to our bedroom and it felt utterly, completely, helplessly inadequate. It lasted a long time. We stood there, Mr Tabubil with his arms tight around my shoulders, until it stopped. So I had a little shake of my own and had to sit down for a minute while the adrenalin wore off! The final verdict was a 7.1. And THAT is quite a quake! There has been very little damage, and only one reported death, an elderly woman from a heart attack. Chileans build their buildings WELL. There were some evacuations on the coast, but for precaution only. The sea receded in places, but there were no tsunami warnings - and no tsunamis. But that's how it goes, you know? If the ground shakes, you go uphill. And for some reason, many Chileans didn't learn that after the Asian Tsunami in in 2004- and they died here when they wouldn't go uphill on 2010. Sebastian had a friend who was on the coast when it happened. He ran for the hills, and he lived. A man who'd stood next to him said "My car is down on the beach!" Sebastian's friend looked at him and said "You're crazy! RUN!" But the man went for his car - and he died. They all know now. The ground shakes and they go uphill. I have three words for you, and they are magic: Australian Shearing Songs. Australians don't have a wild west - not the way North America did. White Australia was a convict colony, pure and simple. There was no war for independence. There was no indigenous populations sufficiently well enough organized to fight back against us. We didn't need a manifest destiny. We had Bushrangers for our outlaws, and because the police weren't always much nicer, we built them up a bit, but there wasn't anything more than wistful ambiguity about what those boys were up to. There was just the land - dry, dusty, marginal land spreading out everywhere you looked and with nothing we counted worth considering in our way, we spread out across it. With sheep. We white folks sent sheep inland by the millions and colonized the continent on their wooly backs. Guess what our folk songs are about? Waltzing Matilda, Ryebuck Shearer, Click go the Shears, Tie Me Kangaroo Down Sport - they're all about those dusty, snaggle-backed sheep and the men who worked them. The songs have got Heroic Ringers, (the fastest shearers in the shed) and Dying Swaggers (the old worn-out men that hung around the place and died there, knowing the ways of the sheep and the shears through to their fingertips) but mostly, they've got the thousands of miles of dusty outback track that the shearers walked on their way between the stations. The Sproglet loved every single song. Preferably played at fifty thousand decibels on the car stereo, with all of us singing along at the tops of our voices, waiting for the tired, grizzly howling to stop and the poor child to fall asleep. "Only two hundred more kilometers to Gundagai!" We'd sing. "'There's a track, Winding back, to an old-fashioned shack-"
One evening, at the end of a night cruise on the Katherine River, the Sproglet decided that she'd had enough. Of everything. Right on the edge of a dusty camping ground. The smile vanished, the eyes squinched shut, the mouth opened and she roared. She'd been battering around Australia strapped to a child seat in a van for weeks without any sort of proper schedule or proper bath-times and she wanted to tell us every single thing she thought about every single bit of it. It was late in the evening - almost nine o'clock. Australian camping demographic is mostly over 60. They tend to retire early. In a fit of desperation, I opened up my own mouth and joined her. "Give me a home among the gum trees-"
" -A Sheep or Two and a Kangaroo-"
"A CLOTHESLINE OUT THE BACK! VERANDAH OUT THE FRONT- "
We staggered backward, stunned into silence by the sheer volume of the sound. For a moment, her eyes popping with disbelief, even the Sproglet stopped howling, and then she opened her mouth again and let the world know. "An OLD Rocking CHAIR" We bellowed right back at her, pitching her headfirst into her car seat and snapping the buckles shut. Sandor turned on the car lights to look for the volume knob, and there we all were - spotlit like singing angels as we threw ourselves into the van, night-blind. At any moment we expected mobs of campers with torches and pitchforks to surround us, screaming Australian imprecations and explaining what they thought of things. Pippa and Thea manhandled the van doors closed at the same time that Sandor found the volume knob and for the campsite, at least, the volume abruptly ceased. Sandor wrestled the van into gear and we got the hell out of there in a choking cloud of Northern Territory Dust. And the Sproglet fell asleep. Just like that. While we wrung the sound out of our ears. It's a good life, being 14 months old. Saltwater crocodiles are primordial monsters- low and squat and scaled, with bloated jaws, ridged backs like dinosaurs, teeth like nightmares, silent, still, swift as lightning -right out of the deepest human dreams. Like all the worst monsters, they don't play fair. You can't read them. There's nothing behind their eyes that you recognize to look back at you. They're still and silent - until they're not. We humans love our warriors - we valorize the hunt and the chase - courage, cognition, the face to face confrontation of the prey. Animals that hunt the way we do - big cats and wolves and bears, we anthropomorphize them, giving them all our own carnivorous virtues. But the unreadable crocodile hunts by ambush -from beneath a sheet of still water - a flash of jaw, a foam of water and then - it's gone. They don't play by any virtues we acknowledge. Frankly, they're creepy. Goose-pimpling, hair-raisingly creepy. Which is why they were permitted to bounce back from extinction - beyond the luxury-leather industry, they are so terribly terribly good for tourism. Who doesn’t want to say that they have looked their ancient human nightmares in the face? And faced it down. Tamed it. Photographed it. Put it in an album, posted it on facebook and say "I was there!" We took a pleasure cruise along the Yellow River (Origin of name unknown. The water was blue) on a flat-bottomed twin-hulled swamp boat. I had my Kakadu moment - blue water and fields of waterlilies (another invasive species- only this time, one that unexpectedly turned out not to be quite so dreadful for the ecosystem as expected, with the additional benefit of being gorgeous as hell with its flat green leaves and electric pink flowers), and muddy riverbanks crowded with ducks and magpie geese, and pandanus and paperbark trees hanging low over the river, with electric blue azure kingfishers darting from branch to branch above our heads. The Sproglet was fretful - twisting and wriggling in Thea's arms. She squirmed loose and clambered across our laps. while we sat in silence, crunching apples and staring over the sides of the boat. Narrow passages lined with freshwater mangroves, the banks closing in on each side of the boat, loomed dense and dark and green, and lurking among the mangrove roots - we saw crocodiles. The boat rocked as thirty people swarmed and pointed - There! A slab of grey resolved into a ridged back - a three meter monster sleeping in the mud. There was a gnawing sensation on my wrist - the sproglet in my arms was making like a crocodile on my apple with all seven of her teeth. Primordial drool trickled down my arm and I watched the creature, disturbed by our low-voiced shrieking, slide down the bank into the water. It vanished without a ripple. Facts: Crocodiles are incredibly intelligent, highly vocal, and the only reptile known to have a genuine maternal instinct toward their young. In physiology, they haven't changed appreciably since the days of the dinosaurs. The terror statistics are very real. Ironically, crocodiles possess every one of the cognitive behaviors we valorise in the other big hunting animals - they track - patiently, and they learn. If you're camping in crocodile country, don't collect water from the same spot in the river every night - they watch you, and they begin to wait. Don't sit on branches that overhang the water - a big crocodile can jump up to two meters. And don’t - don't go swimming where you oughten't - if you do, the odds of being attacked approach one hundred percent. It's not your world up here, it's theirs. Crocodiles aren't the only things in the water. There are sawfish, barramundi, river rats, prawns as long as your arms - it's one of the worlds most vibrant, unspoiled ecosystems - and a world heritage site. We saw a dozen saltwater crocodiles in an hour - basking in the sun on the mud banks or on floating mats of reeds among the waterlilies. Cutting out of the major channel into a billabong, we came across a black dinosaur swimming . Four meters long - he moved economically, his long black tail oscillating back and forth and propelling him swiftly through the water. 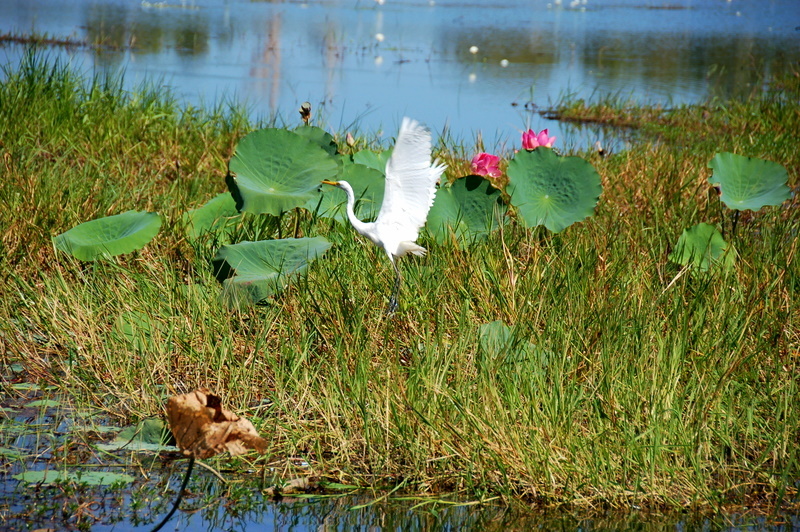 Storks and Ibis and Brolgas and Jabiru birds waded long-legged in the shallows - dipping, and reaching. Our pilot guide did her best to provide a holiday atmosphere with a microphone and a horrendous patter. "Hey guys! Got a good one - a good one! I told you that bird there's there's called a Jabiru, right? You know what his cousin's called? He's called Poke-a-wallaby! Hah!" We ha ha ha'd but were unmoved. The sproglet, having reduced my apple to mush, began to work on Mr Tabubil's. Back on shore, two more boats were loaded and preparing to cast off as we pulled in. Mr Tabubil was carrying the sproglet. Two apples had cheered her up and she was ready to shine. Wrinkling her mushroom nose into a face- splitting smile, she sat up in his arms and bowed, bestowing waves and kissed upon the inhabitants of all three boats. All three boats were enraptured. Travelling with that child is like making a royal progress , basking in reflected glory all the way. Later, back on crocodile-free dry land, we lay on a picnic blanket in the sun. The little monarch collected frangipani blossoms and dropped them on our faces. And sat on them. In her diaper- scented baby-fresh infant glory. It was extraordinary liberty, even for an absolute monarch. Her removal occasioned much howling. Our hotel in the little town of Jabiru was shaped like a crocodile, with four legs and a tail and two glowing red eyes mounted above the reception lobby. The receptionist who checked us in handed us our keys and pulled out a map. "You're right here, in the mouth." He said. "Get back in your car and drive around to that carpark, over there next to his jaw. Walk in through his front paw and go across his shoulders around the pool, and you'll find your rooms." We giggled, and asked if it got old. He snickered. "Depending on the crowd, I'll tell them to go down to the tail, climb up his arse and make a left!" Our hotel was shaped like a crocodile because for the Gaagudju people, who are the traditional landowners of the Kakadu National Park, the crocodile is one of their spiritual ancestors and a part of their creation myth. In the beginning of things, Ginga was a man. Sleeping next to a billabong, he rolled into his campfire and fled into the water to soothe his burned back -that's why crocodiles still have lumpy backs today. As a crocodile, Ginga crawled and carved his way across the landscape, digging and raising it into the shapes that are there now. And once he's completed the job, he turned himself into a ridge of stone - the lumps on his back still there for everyone to see. We wanted to see, so we dropped our bags on the floor in our rooms, climbed back into the car and drove to Ubirr. Ubirr is located in the East Alligator region of Kakadu, because the 19th century European explorers didn't know their alligators from their crocodiles. Ubirr is a natural gallery, a cluster of rocky sandstone outcrops and overhangs covered with rock art. The rocks carry 40 000 years worth of stories, history and lesson and hunting trophies overlapping and interwoven, escher-esque and rorsach blotted, climbing up the walls and across the underhanging lips of the overhangs. We walked up to a 30 foot wall painted with every sort of animal that was hunted in Kakadu across its history. The animals were painted with the insides and the outsides all together - a fishing and shooting guide and an anatomical reference chart all at the same time. Archaeologists have used these paintings to date climate and habitat change - telling when certain animals were found here - and when the climate changed and went away, when they stopped appearing . Among the later drawings there was even a skeleton painting of a white settler in his breeches and his rifle. One wonders at him showing up on a wall of hunting trophies. Among them were long skeletal figures two stories tall. These were the Mimih Spirits - the Australasian version of Europe's fairies and little people. They lived inside the rocks and came out to teach people how to hunt and fish and weave and make fire. You must be careful of them, because they can catch you and take you away with them inside the rocks. So tall and thin that they could slip through cracks in the rock and could be blown away by a stiff breeze, the aborigines believed that they had painted the oldest pictures - they could do that - they brought the rock down to ground level and painted them there. A ranger appeared (out of the rocks? We wondered.) and gave us story lessons. She told us that in the wet season, where we were standing was under half a meter of water - for half the year it was all about boats and crocodiles. So this explained the bare floor of the land we'd been driving over. I was unreasonably happy. 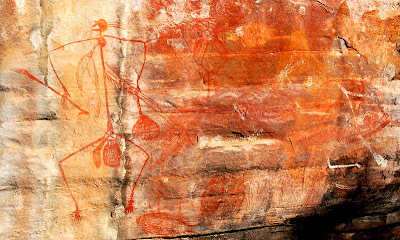 Other rock faces carried other sorts of paintings - stories about law and creation and the life of the people in this place. We wandered from rock face to rock face, climbing up the cliffs. All the time, people were joining us, all climbing upward. We climbed until there was no more up and we spilled over the lip of a flat rock plateau and - my Word, my Gods- in front of us was the sunset and below, as far as the horizon, there was Kakadu- the Kakadu from storybooks and travelogues - ten thousand square miles of water, green and blue and shining in the low light. It was one of those moments, you know? A hundred people were struck dumb, milling about aimlessly and stretching and sighing and then, quietly, finding a place along the edge of the rock to sit and watch the sun go down. Yellow, then orange, then red, then purple. Small and swollen and utterly astonishing. Except that the Sproglet was screwing up her mushroom nose like an infant Popeye and blowing kisses, and half the plateau rather missed the moment when the sun dropped below the green horizon. There were seven tooth'd smiles going on. Some statistics: Kakadu National Park is enormous - almost 20 000 square kilometers in size.. That's half the size of Switzerland. In two days we were going to see an absolutely infinitesimal amount of it. We knew that. But we were going to give it a good try. As we drove south, traffic tapered off until we saw only tourists in camper vans like our own, and trucks on the long-haul route south to Alice Springs. A road train is a tractor unit with a string of trailers behind it - four are average, six are common. They get longer out in the center where the roads are really, truly, primordially, flat and run straight for hundreds of kilometers. On this big country, with its long highways, and rail lines that are drying up and shutting down their spur lines, it's an efficient and economical way of hauling goods. You can hear them coming before you see them. You can feel them coming before you hear them, and if they're carrying sheep or cattle you can smell them before you feel them. They're a roaring in the earth, and then a churning maelstrom of air as they blast past at a thousand knots on two lane roads, and then they're gone - hurtling away from you into the interior of the continent. As we drove further into Kakadu, the dry earth gave way to scatterings of wetland. Mean, patchy things, as seen from the road - little ponds covered in water-lillies. Pretty and pandanus-lined, yes, and - oh, it was silly, but thanks to childhood picture books I'd had the silly idea that Kakadu was 10000 square miles of water, and you parked your car at the waters edge and were poled into the park on a punt. The crocodile warning signs posted every half kilometer along the highway soothed my heart. These signs were dotted across dry basins and empty ditches and watercourses that looked like they hadn't run for centuries. Maybe the Top End wasn't going to be a world-spanning lagoon while we were there, but at some point in the year, the world was water. When you see signs about crocodiles, they're referring to the saltwater species. Saltwater crocs are at the top of the food chain. They live comfortably in fresh wate and salt - paddling hundreds of miles out to see, and cruising hundreds of km inland. They fear no-one. They eat everything. And particularly relish the tourists who think that nature in the raw is a theme park and Disneyland all rolled into one. "Crocodiles are present anywhere there is water, and if you go swimming, the odds of being attacked approach 100 percent." For the first part of the twentieth century, crocodiles were regarded as terrifying pests. Hunting was encouraged and the crocodile leather industry boomed, and the wild populations were almost eradicated. My maternal grandfather was a crocodile hunter up here for a time. It wasn't until the sixties that policy makers recognized that crocodiles might play a genuine role in their own ecosystems. Crocodile farms were established and slowly, people were educated to permit crocodiles to share the landscape. We also passed several fire-warning signs, on which 'Severe' was only the 3rd setting out of 5. One presumes that there are actually 6 settings in total, the last being "Sign no longer here . Check pile of smoking ashes for residual heat." And then, right at the doorpost of the Kakadu National Park, we pulled the car to the side of the road, because there it was. A swamp, a wetland, a carpet of blue water stretching out past the horizon, tangling to dark green trees on the very far edges of sight. It was straight out of the film Ten Canoes - a massive and serene expanse of water. 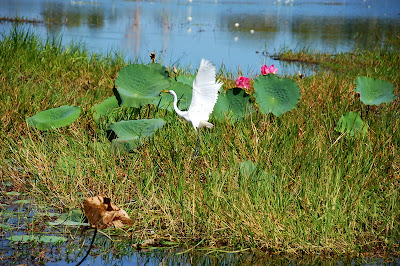 Carpeted with enormous waterlillies -huge leaves, giant pink flowers. Dragonflies skittered. Frogs croaked and plopped and a white egret picked her way elegantly across the face of the water, dipping and skimming with her long orange beak. We all sighed and sat and stared, and stretched ourselves in the silence, and then we got back in the car and drove hell for leather into the park to find our hotel and check so that we could drive a further 40 km further to Ubirr because the ranger at the water had told us that we must go there to watch the sunset.